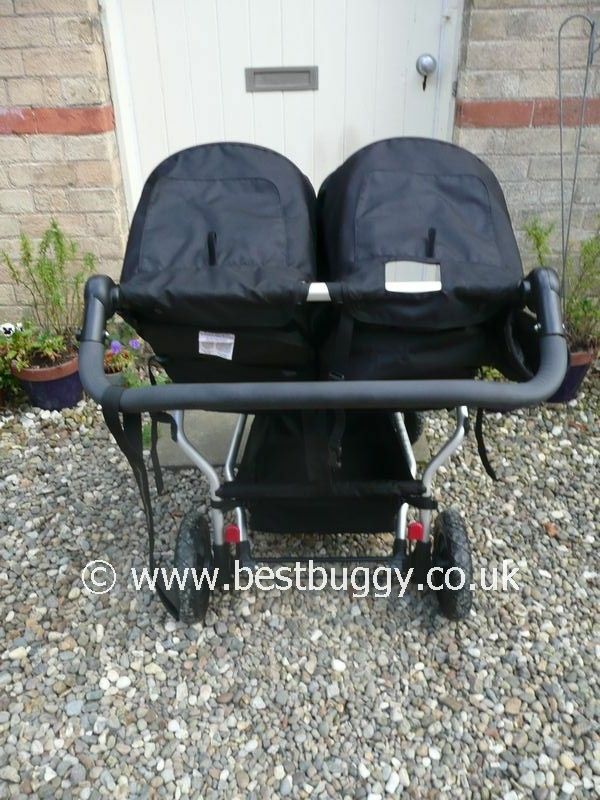 The Mountain Buggy Duet is the smallest side by side twin pushchair on the market at just 63 cms wide. 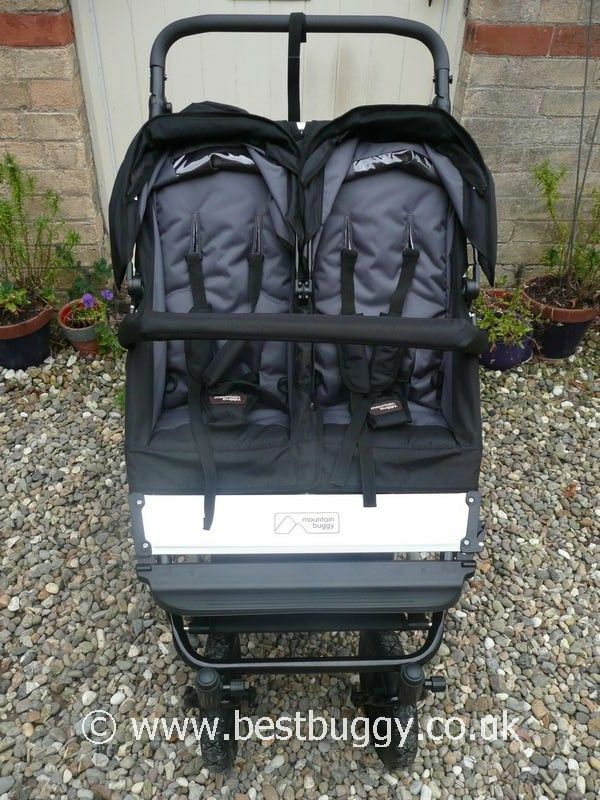 A newborn twin travel system, taking one or two carrycots / parent facing seats or car seats. Suitable for newborn twins, baby & toddler or two toddlers from birth to 4 years old. Large shopping basket. Good for off road as well as around town. 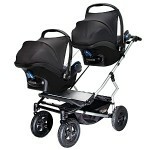 Flexible options - seats, carrycots / parent facing seats and car seats all combine on a slim chassis. 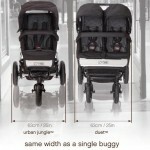 Narrow but with no compromise on seat size (We measure the seat sizes to be the same as the larger Mountain Buggy Duo). Large storage basket. Large individual hoods. Bumper bar is included. 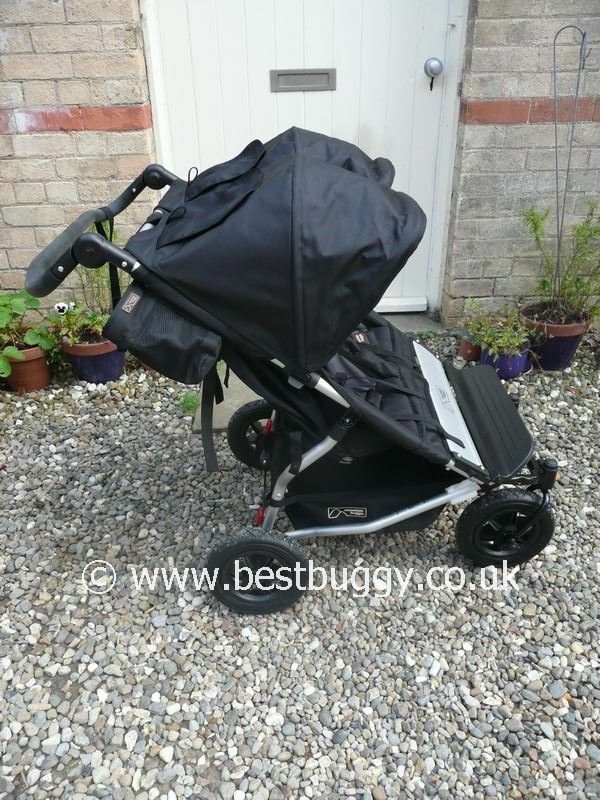 Easily fits through a standard door, narrower than a Baby Jogger City Select tandem! 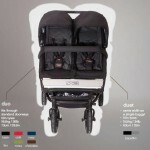 Two Maxi Cosi car seats sit slightly staggered, but also overhang by approx 9cms each side (Cabriofixes). 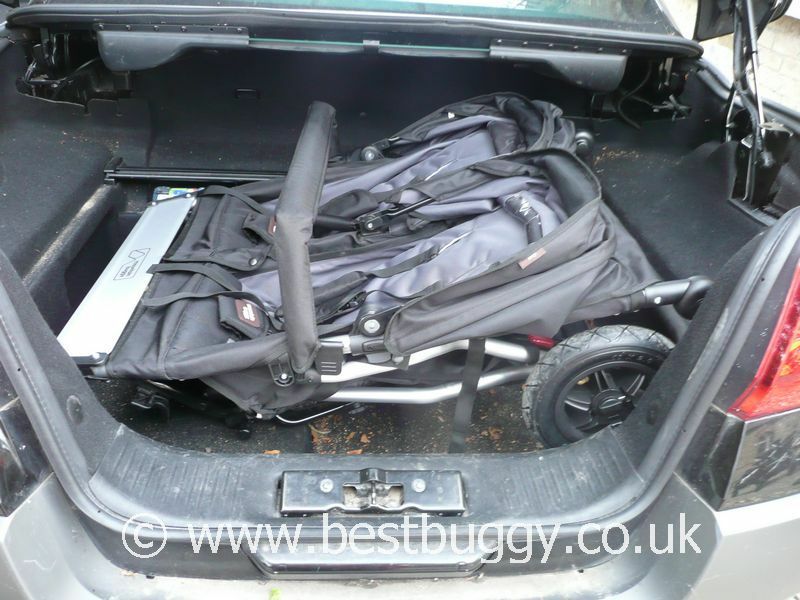 Two car seats would make the Duet approx 81cms wide, so too wide for a standard door frame. The car seat adaptor requires the lower half of the fabric to be removed (or all of it). 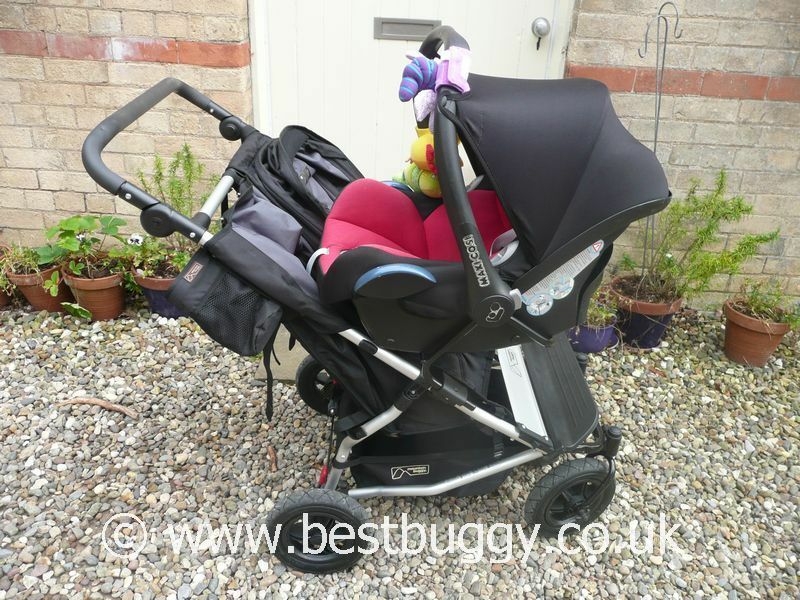 This makes it hard to do a swift change over from car seat to seat mode, as the adaptor needs removing, and the poppers, zip and buckle all need doing back up. 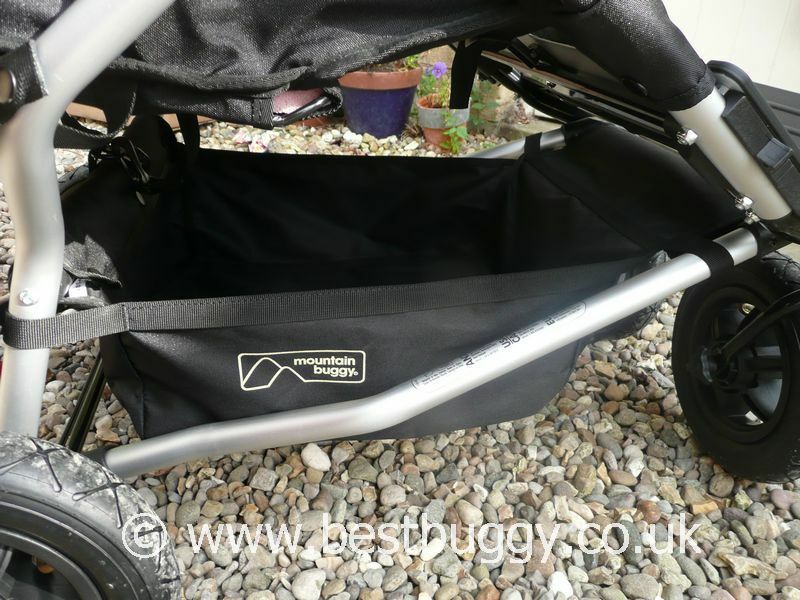 This may be important when a child is over 6 months old and no longer in a carrycot. Fold may be too large for a compact car. Storm / raincover is extra. 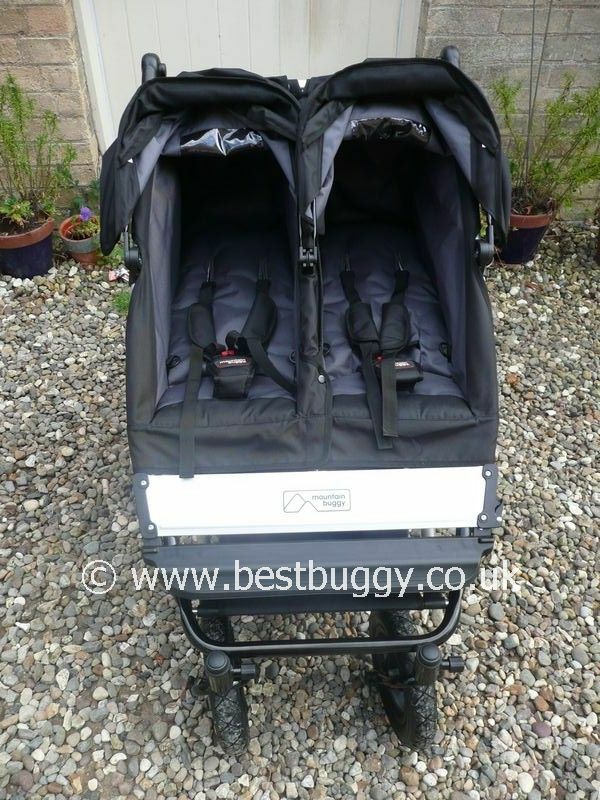 Whilst a carrycot comes with a raincover there is no single raincover option for a baby / toddler configuration. Heavy to carry. 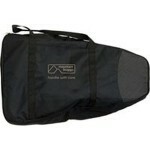 Safety buckle is great but there is an additional easy to undo buckle on the child's shoulders for an easy escape!! Heavy to push with older children in. Handle is relatively low even at the highest setting. 10" Air Tyres. Quick release wheels. 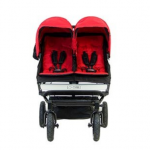 Optional carrycot which turns in a parent facing seat for up to 15kgs. Will take a Free Rider Scooter / Stroller Board.